Plan for the future with confidence. Texas State Bank is proud to provide Trust, Estate, Investment Management, and Retirement Savings Plan services to the people and businesses of West Texas since 1963. 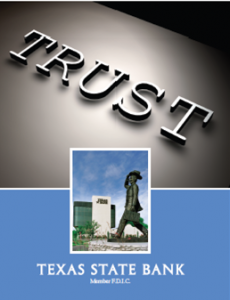 The Trust Department is an important part of the products and services provided by Texas Bank. Our Trust Department takes care of our clients’ property which has been entrusted to us with the highest degree of responsibility and care that no individual can equal. It is the Trust Department’s duty to provide the best service to our clients based on their needs and wishes while maintaining confidentiality and prudent investment standards. Our local staff has years of experience and training in bank, trust, estate, investment, and retirement services. We are available to discuss your needs and questions. For more information, please call Joe Payne, David Vann, or Luke Brame in the Trust Department at 325-944-7528. Office hours: 9 a.m.- 5 p.m. Monday – Friday.